Following the chronological tyre tracks of the early 1960s GTO, the 1980s 288 GTO and F40, and the F50 of 1995 – all limited-production models that showcased the pinnacle of the Maranello firm’s technical capabilities with prices to match – the F60 was first revealed at the Paris show in 2002. Except that it wasn’t called the F60 as every pundit had predicted. It was called ‘Enzo’, or more correctly, the ‘Enzo Ferrari’, in homage to the company’s founder (1898-1988). The £425,000 Enzo boasted a carbon-fiber and aluminum honeycomb chassis, very advanced aerodynamics and a 6-litre 660bhp V12. Weighing 1,365kg and assisted by a sequential transmission able to shift gears in as little as 150 milliseconds, it screamed from to 62mph in 3.65 secs, 0-124mph in 9.5 and did 0-124-0mph in 14.2. The quoted top speed was 217.5mph. It was originally planned that 349 Enzos would be built, but customer pressure persuaded Ferrari to turn out a further 50, all in 2003. A 400th Enzo was completed the following year which Ferrari boss Luca di Montezemolo intended to be gifted to Pope John Paul II. However, the Pope suggested instead that Ferrari sell the car on his behalf with the proceeds going to the SE Asian tsunami relief fund. This car subsequently fetched $1.1 million at an all-Ferrari sale in Maranello in 2005, with that money being donated to John Paul II’s successor Pope Benedict XVI. The same Enzo sold again in August 2015 at an RM Sotheby’s sale in Monterey for $6,050,000. 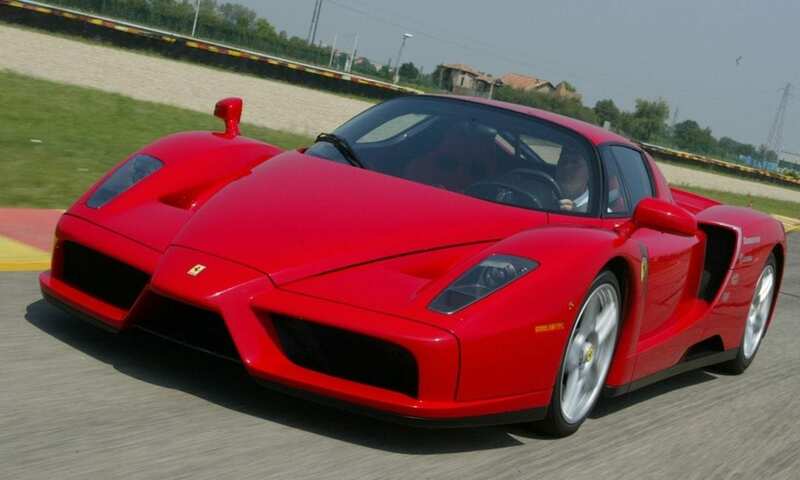 According to London Ferrari specialist Joe Macari, “The Enzo is a car and design that remains one of the brands most iconic to date; not only a fantastic car to drive, but set to be an all-time classic with fantastic investment potential”. Current values range from around £1.5 to £2.25 million, the higher estimate for pristine, low mileage and, most importantly, accident-free examples, as exemplified by this one sold by RM Sotheby’s in Jan ’17 for $2.695 million (c.£2.21m). Conversely, with a £2.3-£2.6m estimate, a yellow 3,600-mile Enzo offered by Bonhams on the same day didn’t sell. From the Enzo were spawned a number of Enzo-based derivations, namely: the £1.1m trackday-only FXX and FXX Evoluzione, the one-off P4/5 by Pininfarina, the £550k Maserati MC12 (50 built for FIA GT homologation), the trackday-only £1m MC12 Corsa and the Maserati Birdcage 75th (one-off concept built in celebration of Pininfarina’s 75th anniversary). 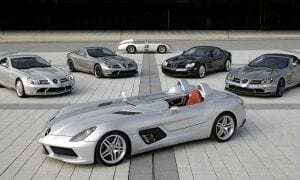 Jointly developed by Mercedes-Benz and McLaren Automotive and first presented in November 2003, the Mercedes McLaren 300 SLR was built at McLaren’s factory in Woking (McLaren being 40% owned by Mercedes at the time) in homage to Mercedes’ magnificent 300 SLR (Type W196) racers of the 1950s. Designed by Mercedes’ Competition Director Rudolf Uhlenhault, the open, 1950s SLRs were powered by a c.310bhp 3-litre straight-8 and their many successes included winning the hugely prestigious 1955 Mille Miglia and that year’s World Sportscar Championship. Stirling Moss, who had famously driven SLR #722 to that Mille Miglia victory, later described the SLR as “The greatest sports racing car ever built”. 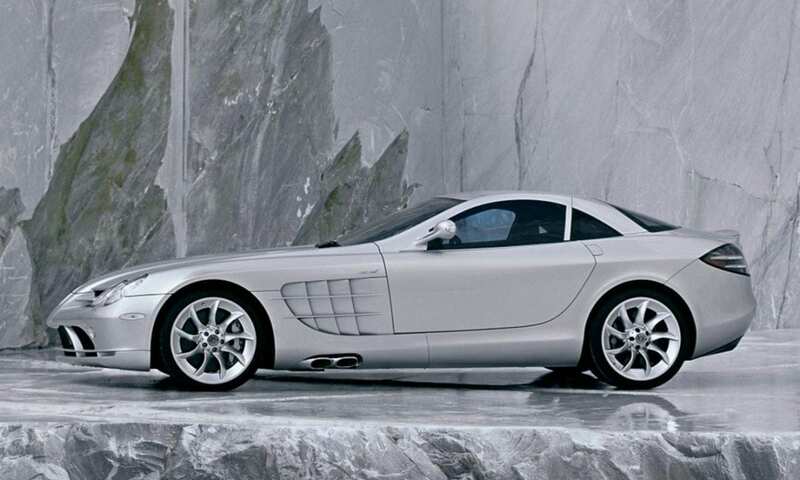 Squeezed in under the 1990s SLR’s long bonnet was an individually hand-built 5,439cc supercharged V8 hooked to a 5-speed auto with a manual program. Quoted power was 585bhp, and weighing in at a somewhat porky 1,693kgs performance was a quoted 0-62 in 3.8, 0-124mph in 10.6, 0-186mph in 28.8 secs with a 208mph max. So not slow, then. Like the 1950s SLRs, stainless exhausts exited from behind the front wheels, but unlike the old ‘Gullwings’, the new coupe had scissor doors. Under heavy braking the rear spoiler rises by 65°, increasing drag and therefore braking – another nod to the 190mph SLRs raced at Le Mans in 1955 which had a huge, rear airbrake. 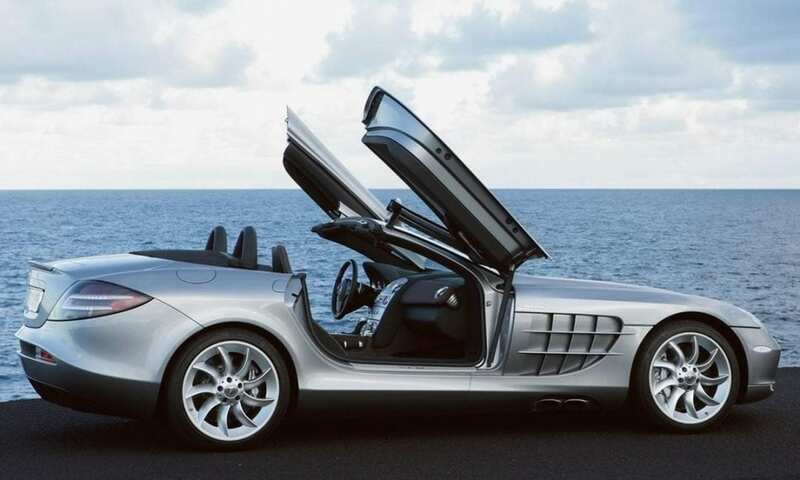 Mercedes had originally intended to produce 3,500 latter-day SLRs, and in a bid to boost sales the convertible SLR Roadster went on sale in September 2007. Initially priced at £315k (coupe) and £350k (Roadster), by the end of 2010 about 1,800 had been sold worldwide. Although that fell way short of Mercedes’ projections, the quantity produced, coupled with iffy styling, mean they’re now valued from around £155k to £205k. In other bids to sell more cars, a variety of limited-edition SLR spin-offs were produced: the 722 Edition (a £334k homage to Moss’ Mille Miglia-winning SLR), the Brabus SLR (£434k), the Roadster 722S (£370k), the 722 GT (a £750k ‘SLR Club Trophy’ racer), the Stirling Moss (a £660k restyled open roadster) and finally, in 2011, the McLaren Edition (a c.£520k Roadster 722S). According to Porsche, the Carrera GT was conceived in 1998 during the Le Mans 24hr – the race in which Porsche secured its 16th outright victory. The idea was proposed for a road-going sportscar based number onely on racing technology, and in the autumn of 2000 the idea began to take shape. That ’98 24hr race was won outright by a Porsche GT1 – a limited-edition model that had gone on sale (c.$1m) the previous year in road-legal guise for GT1-class race homologation. Essentially it was a very hi-tech, lightweight, mid-engined, water-cooled 911 coupe that looked like it had melted slightly. The rules soon changed and this put Porsche’s plans into disarray. The company had reckoned on fielding on a full prototype racer at Le Mans in ’99, to be powered by a secretly-built 5.5-litre V10 originally designed in 3-litre guise for the ’92 Footwork Formula 1 team. 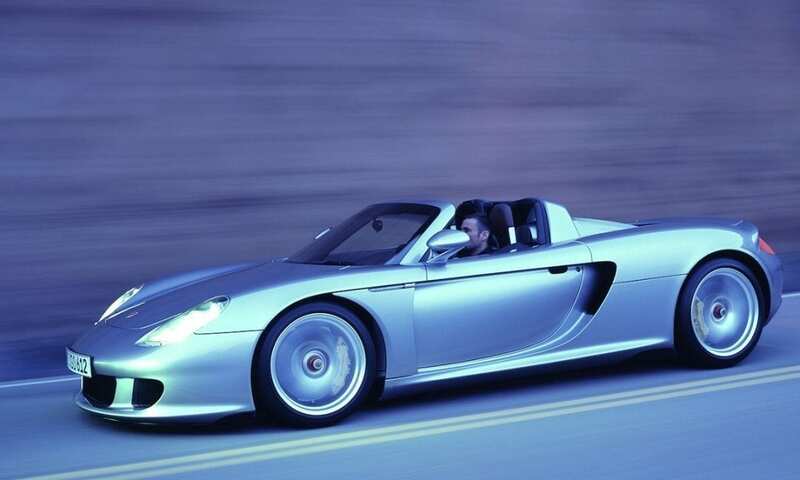 Both those racing intentions fell by the wayside, but the project wasn’t completely buried as Porsche subsequently revealed a 5.5-litre V10 Carrera GT road-car concept at the 2000 Paris show. 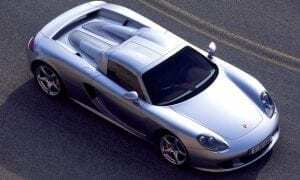 From that came the production Carrera GT roadster (with removable hardtop) which first went on sale in early 2004. Now you might deduce that the mid-engined Carrera GT borrowed much technology from the GT1, especially after comparing the performance figures: 0-62mph in 3.6 secs (GT1) and 3.8 secs (Carrera GT), top speed 206mph (GT1) and 205mph (Carrera GT). However, the hard-core GT1 was powered by a twin-turbo 544bhp 3.2-liter flat-6, whereas the much more civilized Carrera GT had a naturally-aspirated 5.7-litre 68° V10 that punched out 612bhp. Engine-wise the two were chalk and cheese, and at 1,380kg the carbon-fibre-tubbed Carrera GT turned out to be 130kg heavier than the road-going GT1, but Porsche did employ many GT1 technologies on the Carrera GT. These didn’t include the GT’s wooden gear knob – a nod to the first Porsche (a 917) to claim outright victory at Le Mans which, as a last-minute measure to reduce weight, was fitted with a balsa wood knob! The Carrera GT also came with two fitted travel bags, a briefcase, a shoulder bag and a centre console bag, all in leather matched to the car’s interior. No Le Mans driver hammering along at over 200mph ever enjoyed that kind of luxury. Porsche built 1,270 Carrera GTs up to May ‘06, almost half of which were promptly sold in the USA. Porsche GB was allotted 49 cars, and they too all sold like hot cakes for around £330k. Depending on condition, mileage etc., current values range widely – from around £250k to £570k – although this one sold for $742,500 (c.£608,605) in Jan ’17. Unlike its chief rivals Porsche didn’t feel the need to produce any further Carrera GT-based models or spin-offs, but the car undoubtedly served as inspiration for the 2013-15 918 Spyder. Meanwhile, we’ve created bespoke finance solutions for cars of this calibre for numerous clients. To discuss how we might help you own the car of your dreams, call one of our experts today on 020 3355 0035.